The first World Cup came to an end – and the United States the first World Champions. What effect had the tournament had, and how did it influence the future? The United States - one of the favourites for the first Women's Rugby World Cup - were triumpant in Cardiff on the afternoon of the 14th April 1991. The Times reported: “THE United States became the first world champions in women's rugby union after biding their time before pulling England apart by 19-6 in the second half of the World Cup final in Cardiff . “In the first half, England had kept the Americans penned back in a tight and turgid show of muscle. The “”locks from hell” and the “turbo props'” could do little to counter a disciplined display from the England forwards. Facing the heavier American line-up, the English pack finally proved that organisation can counter brawn, scoring a penalty try from a well-worked five-metre scrum. Converted by Gill Burns, the English drew first blood to go 6-0 up. “But the United States, tackling with power and skill, were always going to come back. The turning point came after half an hour when a Francis fumble allowed the United States to press forward, winning a penalty. Harju converted, there were points on the board and the Americans were given a new lease of life. "Organisers estimate that disappointing gate receipts and the failure to attract major television coverage and sponsorship added up to losses of about £15,000. The organisers were faced with personal liability. "'It was a blow after all the hard work we put in to make the tournament a success,"" said Sue Dorrington, one of the organisers." ""The offers were made at the post-final banquet by the men who wish to remain anonymous," Dorrington added, admitting that holding the tournament in the same year as the men's World Cup was a mistake. 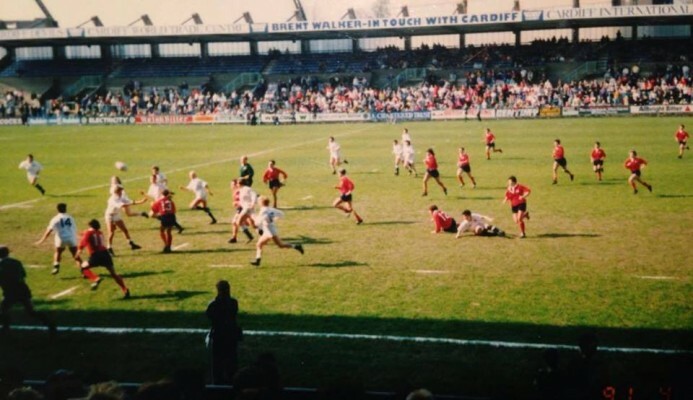 Almost 3,000 spectators watched the final, in which the US beat England 19-6 at Cardiff Arms Park." “AS THEIR erstwhile rivals returned home yesterday a posse of weary women paused to reflect on their achievements of the last week in organising the first world tournament for women rugby players. If 12 competing countries does not appear, on the surface, to embrace the entire globe it has been, none the less, a considerable success. “The event, which reached its climax on Sunday in Cardiff when the United States beat England 19-6 in the final, has been run on a shoestring, with none of the trappings of the modern men's game - no big sponsors, no back-up, limited accommodation, but huge reserves of enthusiasm and considerable organisational skill. It was a tournament run for players by players who were prepared to risk their own money to bring their particular dream to fruition, and in that sense has taken rugby back to its original and purest roots. “The organising committee deserves such generosity, though there is also a moral responsibility on the men's game to ensure that none of the women is out of pocket: the International Rugby Football Board, the Rugby Football Union and the Welsh Rugby Union were all represented at the final and they have been told how hard the women have worked to keep costs down. Indeed a draft set of accounts will be sent to the Sports Council later this week and it is hoped that the necessary financial assistance may be forthcoming. “During the summer, countries interested in hosting the next World Cup can put in bids which will be considered during a meeting in Madrid in September. Looking back now Griffin, also recalls the financial difficulties. "We took on a sponsor agent to try and raise money but we tried to do everything without spending any money! We looked at a number of cities to host and Cardiff offered a lot of help including paying for Welcome Ceremony and closing dinner. All teams paid for themselves and in those days clubs didn't charge the way they do now! We ended up with a £36,000 loss which was basically the £30,000 fee from the sponsor agent (they only found value in kind sponsorship) and £6,000 for accommodation/food that the Russians didn't pay. Dudley Wood, the Secretary of the RFU settled it for us. Prior to the tournament, only half of the participants came under the umbrella of their national rugby unions. Although this had a positive effect in that it allowed the then independent New Zealand women’s team to ignore NZRU opposition to the event, the lack of recognition did not help expand the game. As a result one of the most positive outcomes of the tournament was that, within a few months, the Italian, Dutch and New Zealand unions all now welcomed women’s rugby. By the end of 1992, of those teams taking part, only rugby in Wales, England and Japan was still organised by separate women’s unions (which, in the case of Wales and England, would remain the same UK-wide union for another three years). The IRB, however, remained a male-only club, refusing to recognise the 1991 tournament (a position they maintained until 2010) or the planned follow-up. That stance nearly torpedoed the second World Cup in 1994, ensuring not only that New Zealand, Sweden and Germany had to refuse invitations but also leading to the original hosts, the Netherlands, pulling out at the eleventh hour. Fortunately Scotland stepped in at a last minute to run another successful event, and in 1996 the IRB finally accepted responsibility for the women’s game. If the immediate political legacy of the first World Cup was limited, its effect on those who had taken part was another matter. The United States returned in glory to a White House reception and a level of recognition and support that would see them to two more World Cup Finals. And the game – even where it remained separate from the main unions – became more professional in its organisation, especially for the national team, and player numbers slowly began to grow. The first Women’s Rugby World Cup in 1991 may not have changed the world, but it laid the foundations for the future of the women’s game.